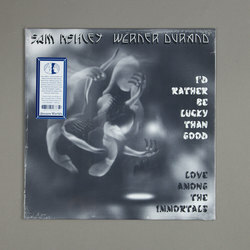 Sam Ashley & Werner Durand - I'd Rather Be Lucky Than Good. Vinyl LP. Bleep. Here we see German experimental music lynchpin Werner Durand join forces with vocalist Sam Ashley for an LP of side-long spoken-word pieces. Ashley has a fabulous voice for storytelling, and on I’d Rather Be Lucky Than Good his rich Southern twang is entwined with Durand’s eerie wind instrumentals. Durand’s chiming reeds bring to mind a more sparse, abstract rendering of the woodwind vistas on Björk’s Utopia. I’d Rather Be Lucky Than Good is out via Unseen Worlds (Thighpaulsandra, Rabit).